I am a new user and have been struggling with a frame size issue recently. Was curious to see what some of the more knowledgabe/experienced posters here might say. I am 181 cm tall with an 89 cm inseam. Also have short femurs so I have a forwardish setback. 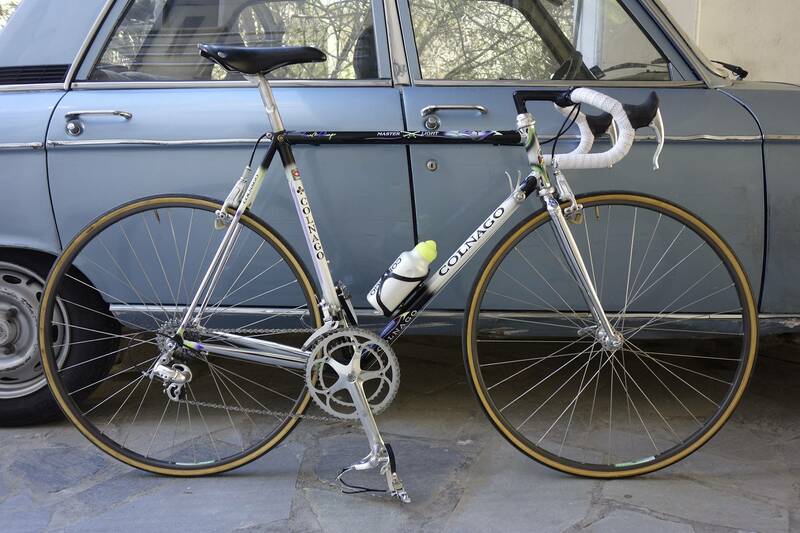 Currently riding two Colnagos: one is a Super from the mid-80s in size 57 and one is CT2 in size 58. I am not sure if my CT2 is too big. While the Super fits quite well, I can't seem to dial in the CT2. The Super has a TT of about 55.7 and the CT2 about 56.3. Super currently has a 100 mm stem, but I could probably bump it up to 110. CT2 has a 110. In terms of drop, the Super is right on the limit of comfort for me (about 10.5-11 cm), while the CT2 is around 9.5 cm. Would it make sense to drop down to a 100 stem on the CT2 to solve what I suspect are reach issues (neck and shoulder pain on rides over 40km)? Is it possible the CT2 frame is simply too big? Last edited by Colonia on Fri Jul 27, 2012 11:03 pm, edited 1 time in total. In standard Colnago geometry, at your height, I would have said a 58 is a size too big. Younger guys tha me would probably go for a 56. KB wrote: In standard Colnago geometry, at your height, I would have said a 58 is a size too big. Younger guys tha me would probably go for a 56. I think with my leg length though, the drop is almost perfect on the 58. I am not sure I could handle the drop on a 56. I just don't get why I feel like I am reaching on the 58; according to the numbers the increase in reach isn't that much. Last edited by Colonia on Thu Mar 28, 2013 11:05 am, edited 2 times in total. Have you got similar saddles and are the setbacks the same on both bikes? Buy a cheap shorter stem to experiment with. 5 8 5 wrote: Have you got similar saddles and are the setbacks the same on both bikes? Yup. I run Regals on both bikes and setback is identical. Was hesitant to try a 100 on the 58, as I didn't want to go shorter than 110, but I guess a 100 is still within the standard parameters of fit for the frame. I don't know if the STAs are different, otherwise 6mm difference in TT is between stem sizes. The other possibility is a different reach on the handlebars + the TT difference. Measure from the tip of the saddle to the centre of the bars to check. 5 8 5 wrote: I don't know if the STAs are different, otherwise 6mm difference in TT is between stem sizes. STAs are slightly different -- CT2 is just a bit slacker. Difference from saddle tip to bar center is .5 cm. I suppose it could be that the 10-speed hoods on the CT2 are accounting for the difference, since my Deda bar has about the same reach as the old Cinelli 64. The Super has C-record hoods. I guess the 110 stem needs to go. I also think 58 may be big for you. I am 182cm and ride a 57. I am 183 and ride 56cm C50 with 100mm stem, it's perfect fit. 58 frame and 110mm stem seem would definitely be too much for me, esven being 2cm taller than you. Start off with experimenting with shorter stems and maybe saddle position too (even few millimeters can be a massive difference in comfort) - naturally it's much easier & cheaper to start with replacing the frame, isn't it? llhh wrote: I am 183 and ride 56cm C50 with 100mm stem, it's perfect fit. 58 frame and 110mm stem seem would definitely be too much for me, esven being 2cm taller than you. Start off with experimenting with shorter stems and maybe saddle position too (even few millimeters can be a massive difference in comfort) - naturally it's much easier & cheaper to start with replacing the frame, isn't it? Kgt and IIhh, what are your inseams? I think that is the one area that makes me unsure about sizing down any further than a 57. I have about an 89 inseam and ride a saddle height of 78. With my 57, I am pretty much maxed out on drop... That was my reason for going 58 with the CT2 when I bought it. I thought a general Colnago sizing rule was to take the BB-saddle top measure minus about 20 cms? 1cm frame differences aren't as critical as Small / Medium / Large frame sizes etc. Try the shorter stem. It sounds like you should be able to get a position very close to your Super. Colonia wrote: Kgt and IIhh, what are your inseams? I think that is the one area that makes me unsure about sizing down any further than a 57. I have about an 89 inseam and ride a saddle height of 78. With my 57, I am pretty much maxed out on drop... That was my reason for going 58 with the CT2 when I bought it. I thought a general Colnago sizing rule was to take the BB-saddle top measure minus about 20 cms? Mine is 86cm. I would still consider the top tube length as the critical dimension. Saddle high is something you can adjust. Reach is much more important. Colnago suggests longer stems anyway. I think I might have to experiment more with the 58.